At North Oak Manufacturing you can expect premium construction and materials that will give your residential or commercial project unsurpassed style and function. Established in 1981, North Oak Manufacturing works in collaboration with clients to design and fabricate custom cabinetry, countertops and millwork at our own manufacturing facility staffed by highly skilled craftsmen. 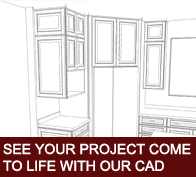 Quartz countertops including "Zodiac & Cambria"
Realize Your Dreams – Visit Our Showroom! Let us show you how North Oak Manufacturing can meet your needs. Happy with your latest North Oak project? Please let us know how we did.